026 – Witches of Eastwick | All Eighties Movies. All The Time! 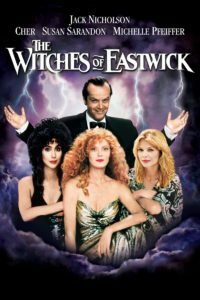 ← Coming up – the Witches of Eastwick! This entry was posted in Podcasts and tagged comedy, drama, fantasy, witches. Bookmark the permalink. Cher, Michelle and Susan with Jack – perfect mix. 80’sHog told me about this podcast! So fantastic – you have covered so far most of my favorite eighties movies. I love how you both love these movies, love your Australian accents and just adore the trivia and especially the music! I’m a fan for sure. And I LOVE The Witches of Eastwick. I sat and watched with my 15 and 13 year old daughters and they loved that movie too. Looking forward to a should out as you call them.